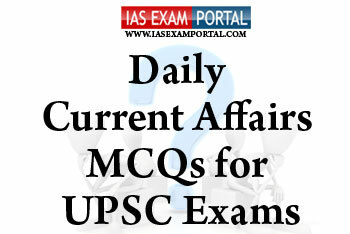 Current Affairs MCQ for UPSC Exams - 01 FEBRUARY 2019 | IAS EXAM PORTAL - India's Largest Community for UPSC Exam Aspirants. Q1. Which of the following with respect to India Post Payment Bank (IPPB) are true ? 1) In a major boost to financial inclusion in the country, the IPPB has become the largest bank in terms of reach and network in realization of its objective of being the most accessible, affordable and trusted bank for the common man. 2) In a large digital literacy program, more than 2.5 lakhs last mile delivery agents (Postman, GDS) have been trained and certified to provide door step banking services and promoting financial literacy in the rural areas. 3) Over 1 lakh Post Office savings bank customers are enjoying interoperable banking services by linking their Post Office Savings Account to the IPPB account but a major drawback is that these accounts cannot be used for DBT. Q2. Which of the following personalities/offices are involved in the selection committee which scrutinizes thepanel of names recommended by the search committee for appointment as Chairperson and Members of the Lokpal ? Q3. Which of the following includes the model code of conduct (MCC )issued by the election commission of India ? 1) The code instructs that public spaces like meeting grounds, helipads, government guest houses and bungalows should be equally shared among the contesting candidates. These public spaces should not be monopolized by a few candidates. 2) The ruling party ministers should not make any ad-hoc appointment of officials, which may influence the voters in favour of the party in power. 3) The contesting candidates and their campaigners must respect the home life of their rivals and should not disturb them by holding road shows or demonstrations in front of their houses. 4) Candidates should not display their election symbols near and around the poll booths on the polling day. No one should enter the booths without a valid pass from the Election Commission. 1) As per recent estimates there has been a record production of Horticulture Crops in India with production during the year 2017-18reaching 311.7 MT which is 3.7% higher than the previous year and 10% higher than the past 5 years’ average production. 2) National Horticulture Board (NHB) was set up by Government of India in April 1984 on the basis of recommendations of the "Group on Perishable Agricultural Commodities", headed by Dr M. S. Swaminathan. 3) India is the largest producer of mango, banana, coconut, cashew, papaya and pomegranate and second largest producer of spices in the world. Q5. Which of the following north eastern states of India has declared ‘PakkePaga Hornbill festival’ as the state festival ?